2006-01-06 Application filed by Aromatic Technologies, Inc. filed Critical Aromatic Technologies, Inc.
Wicks and candles with reduced smoke production. In presently-preferred embodiments, the wick includes a flame-retardant material that is dispersed substantially uniformly throughout at least a portion of the wick. The flame retardant material may be distributed throughout the wick or selectively in the sheath or core of the wick. In an alternative embodiment, the flame-retardant material may be uniformly dispersed in only a portion of the strands of the wick. The flame-retardant material is included a concentration that reduces smoke production, malodor production, or afterglow in the wick or candle after the candle is extinguished. Presently-preferred components of the flame-retardant material include inorganic salts that include bromine, phosphorus, or boron, organohalogens, or phosphorus-containing compounds. 60/642,137 filed January 6, 2005. [2 ] Candles have been used for centuries as light sources and more recently to impart pleasant odors into the air through the use of fragrances added to the candle wax. Early fabricated candles produced significant quantities of smoke and soot as they burned. As technology has improved in the manufacture of candles, the burning characteristics have also improved. Most modern candles today bum very cleanly without excessive smoking as they burn. [3 ] While most modem candles do not smoke when burning, even the cleanest candles tend to produce significant quantities of smoke when the flame is blown out. The smoke that is produced when a candle is blown out occurs as a result of the incomplete combustion of the wax that remains in the wick being poorly combusted by the embers remaining within the wick. The smoking usually continues to occur until the embers finally go out also. The smoking candle also produces a malodor from the incompletely burned wax. This smoking is unpleasant, especially when the primary purpose of a fragranced candle is to produce a pleasant odor in the air. The malodor produced from the blown out candle is perceived as a real negative by the user. Devices have been designed to prevent a candle from smoking when it is extinguished. Metal smokeless candle snuffers have been invented that bend the lighted candle wick into the candle wax, thereby putting out the flame without allowing a burning ember in the wick to produce incomplete combustion of the wax remaining in the wick. After putting out the flame the wick must then be straightened in order to be lit again the next time the user wishes to light the candle. The candle snuffer is not easy to use and requires that it be cleaned after each use using a tissue or paper towel. Additionally, the snuffer has to be stored in a convenient location for future use. A candle snuffer is an inconvenience for someone who does not wish to have to store and clean a device to prevent their candle from smoking when extinguished. Additionally, convenience would require a separate snuffer in proximity of every candle, which in many households is an undue expense and storage problem. [5 ] Flame retardant materials have been included in candles previously (U.S. patent application no. 2003/0124474). The flame retardants have been incorporated into the fuel portion of the candle to produce self extinguishing candles. The incorporation of a flame retardant into the fuel does not prevent the candle from smoking when blown out. [ 6 ] Flame retardants have also been used in the wick holder (U.S. patent application no. 2004/0048213). The incoiporation of the flame retardant into the wick support helps to extinguish the flame when it reaches the bottom of the candle. This is done as a safety feature to prevent the consumption of all of the candle fuel causing the bottom of the candle to become dangerously hot. This use of flame retardant does not reduce the smoking of a candle when it is blown out. [7 ] Flame retardants have been used in a wick to automatically extinguish the flame (U.S. patent application no. 2004/0091829). The flame retardant is contained only in the lower portion of the wick. As the candle burns and consumes itself, the lower portion of the wick that contains the flame retardant comes into the flame and automatically extinguishes the flame. The flame retardant is not present at a consistent level but rather is concentrated in lower sections of the candle to promote the self-extinguishment of the candle. [ 9 ] The present invention includes systems and methods for reducing smoke and malodor production by incorporating a flame retardant into at least a portion of a wick. The flame retardant is preferably included at a concentration that will not extinguish the flame but rather that will reduce the smoking and malodor resulting when the flame is extinguished. In one embodiment the present invention is comprised of a solid wicking material in intimate proximity to a flame retardant. The flame retardant is present at a substantially uniform level throughout the wick such that when a flame is extinguished the wick exhibits reduced smoking as compared to normal untreated wicks. In one embodiment the flame retardant is present in the fuel at a level that will not extinguish the flame but will reduce smoking and malodors when the flame is extinguished. A wick that has been treated with the flame retardant may be incoiporated into a candle, an oil lamp, or any other wick-burning device. The wick of the present invention may be constructed from any wick material that can sustain a flame. Numerous wick materials are currently used in commerce. These include materials comprised of cellulose, cotton, paper, fiberglass, polymer, ceramic, and fabric. Wicks that are cored may be used also including paper-cored, cotton-cored, and metal-cored wicks. The preferred properties of the wick used in the present invention are its ability to transfer a liquid fuel from a reservoir to the flame and the ability to be associated with a flame retardant at a level that allows the flame to propagate but prevents a burning ember from allowing smoking after the flame has been extinguished. [H]- Flame retardants described in 'The Chemistry and Uses of Fire Retardants" by J. W. Lyons, Wiley-Interscience (1970) are suitable for use in the present invention. The flame retardants described in this book are incorporated by reference herein in its entirety. Suitable flame retardants for use with the present invention are those that can be incoiporated into a wick. A preferred flame retardant is incorporated into the wick and does not substantially migrate from the wick into the fuel either during storage or during the burning process. These may be inorganic, organic, or organometalic compounds. The flame retardant may be liquid, solid, or semi-solid. Examples of suitable flame retardants are disclosed in U. S. patent application 2003/0124474 and U. S. patents 6,005,033; 5,886,072; 5,766,568; 5,710,202; 5,409,976; 5,397,509; 5,158,999; 4,842,609; 4,430,467, and 4,401,778. The disclosures contained within the above documents are incorporated herein in their entirety. Suitable flame retardants include organohalogen compounds. Preferred halogens are chlorine and bromine. Synergists may be included with the halogenated flame retardants. Other suitable flame retardants include inorganic flame retardants. Metalhydroxides may be used as flame retardants. Examples of inorganic metalhydroxide flame retardants that may be used in the present invention include aluminum trihydroxide and magnesium hydroxide. Other suitable inorganic flame retardants include zinc borate, and other borate, tin and zinc compounds. Phosphorous-containing flame retardants may also be used in the present invention. The fuel of the present invention may be liquid, gel, or solid. Suitable liquid fuels may include a hydrocarbon oil, petroleum oil, vegetable oil, mineral oil, animal oil, naphthenic oil, synthetic liquids, paraffinic oil, solvents, alcohol, esters, and combinations thereof. Gel fuels may be used that contain liquid fuel as described above plus a gellant. Suitable gellants include polyamides, ester terminated polyamides (ETPA), amide terminated polyamides (ATPA), block copolymers, and combinations thereof. Solid fuels include wax, polymeric materials, and combinations thereof. Suitable waxes may be derived from animal, vegetable, petroleum, and synthetic sources. Animal and vegetable wax may include tallow wax, spermaceti, beeswax, and soy wax. Petroleum wax contains purified hydrocarbons that form solid bodies at room temperature. Paraffin wax is a petroleum wax. Synthetic waxes such as VIBAR are comprised of medium and long chain polyethylene. Additives may be included in the fuel of the present invention. Suitable additives include antioxidants, UV inhibitors, colorants, icons, hardness modifiers, fragrances, malodor counteractants, pesticides, insect repellants, antimicrobials, stabilizers, glitter, pearlizing agents, and surfactants. [ 14 ] The particular manner by which the flame retardant is incorporated into the wick is dependent upon the nature of the flame retardant. In a preferred embodiment water-soluble flame retardants may be solubilized into water or other suitable polar solute prior to dipping the wick into the solution containing the retardant. A typical wick may then be dipped into this solution and dried, leaving the residual flame retardant dispersed throughout the wick. This approach is particularly suitable for flame retardants that are water soluble salts. 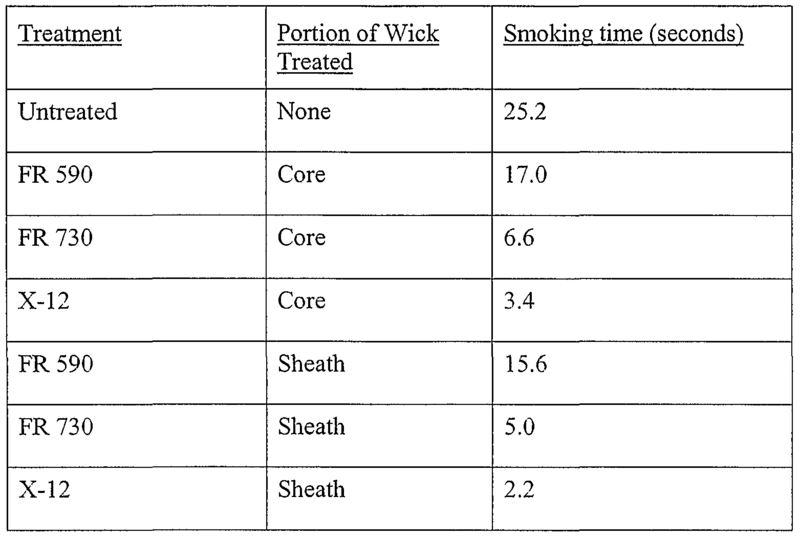 Flame retardants that can be incorporated into the wick using this method produce especially uniformly coated wicks. A coated wick is hereby defined as a wick onto which a material is adhered, integrated, attached or otherwise associated in a permanent or temporary manner. A particular advantage to using this procedure to introduce the flame retardant into the wick is that the amount of retardant can be easily controlled by the percent of flame retardant that is in the aqueous solution. A lower percentage of flame retardant in the solution will allow excess smoke to be formed. A higher proportion of flame retardant may not allow for the flame to bum properly. By varying the percent of any specific soluble flame retardant in the solution the optimal amount of retardant can be incorporated into the wick. One such procedure to embed a flame retardant into a solid substrate is described in U. S. Patent No. 5,912,196 which is incorporated herein in its entirety. Suitable wicks for use in the present invention are known to be manufactured by Atkins and Pierce, Covington, Kentucky. Alternatively, the wick may also be coated with particulate materials. One method of incorporation of the flame retardant into the wick is whereby a non-solute soluble flame retardant is slurried in a volatile liquid. The wick may then be drawn through the slurry whereby a portion of the flame retardant slurry adheres to the wick. Subsequent drying of the wick results in a wick of the present invention. The removal of the liquid in which the retardant is solubilized or slurried from the wick prior to incorporation of the wick into the candle is preferred- although not required. Alternatively, the wick may be drawn through a dry flame retardant. Physical adherence of the flame retardant to the wick can produce a wick of the present invention. The wick may be treated wholly or partially with the flame retardant. In one embodiment only the core of the wick may be treated. In an alternative embodiment only the outside (or sheaf) of the wick is treated with flame retardant while the core of the wick is left untreated. [ 17 ] In a preferred embodiment the wick can also be treated by treating only some of the strands of the wick braid prior to braiding the wick Those treated strands are then braided with untreated material. That process allows for further control of how much of the wick is treated. [18 ] In another presently-preferred embodiment, the flame retardant material is distributed throughout a longitudinal aspect of the wick. For example, the wick may be treated with the flame retardant material on only one half of the cross-sectional aspect of the wick, but throughout the entire longitudinal aspect of the wick. Alternatively, the wick could be treated along a longitudinal aspect of the sheath or of the core, independently of one another or in combination. The concentration of flame retardant material that is included in the wicks and candles of the present invention will depend on several factors including, but not limited to, the material of which the wick is made, the size of the wick, the fuel that is used in the candle, and the type of flame retardant material. The flame retardant material is preferably present in a concentration that does not extinguish the candle during burning, but rather is present in a concentration that causes reduced smoke and malodor production and reduced ember formation following user-induced extinguishing of the candle. One of skill in the art will be able to determine the particular concentration of flame retardant material for each embodiment based upon the variables detailed above through routine experimentation and the description provided herein. hi one embodiment the wick can be treated with a flame retardant by incorporating the flame retardant into the wax coating that is on the wick. As the wax is consumed the flame retardant associates itself with the wick producing the advantageous benefit of reduced smoking and malodor production when extinguished. In a preferred embodiment the wick is coated with a wax or other flammable thermoplastic material. The coating of a flame retardant treated wick insures that the wick can be lit initially. Without a wax coating the wick can be difficult to light for the first time. In an alternative embodiment, a candle may contain a flame retardant within the fuel. As the fuel melts and travels through the wick via capillary action to be burned, the flame retardant is thus introduced into the wick at a level that does not extinguish the flame but will reduce the level of smoking when the candle flame is blown out. The flame retardant may be present throughout the candle fuel in a uniform concentration or the concentration of the flame retardant may vary. The proper concentration of flame retardant is dependant on the type of retardant, fuel and wick. Empirical testing is typically required to define the parameters for each different combination. Paper-cored wicks 44-20-18Z from Atkins and Pearce, Covington, KY, were soaked or not soaked in liquid flame retardant X- 12 from Robson Thermal MFG, Richmond BC, Canada, and dried and placed into container paraffin wax candles containing 7% fragrance. The candles were lit and allowed to bum for 1 hour. The candles were then blown out and the amount of smoking was measured. Paper-cored wicks 44-20-18Z from Atkins and Pearce, Covington, KY, were soaked or not soaked in liquid flame retardant FR 590 from Robson Thermal MFG, Richmond BC, Canada, and dried and placed into container paraffin wax candles containing 7% fragrance. The candles were lit and allowed to burn for 1 hour. The candles were then blown out and the amount of smoking was measured. Paper-cored wicks 44-20- 18P from Atkins and Pearce, Covington, KY, were soaked or not soaked in liquid flame retardant X- 12 from Robson Thermal MFG, Richmond BC, Canada, and dried and placed into pillar paraffin wax candles containing 7% fragrance. The candles were lit and allowed to burn for 1 hour. The candles were then blown out and the amount of smoking was measured. Paper-cored wicks 44-20-18P from Atkins and Pearce, Covington, KY, were soaked or not soaked in liquid flame retardant FR730 from Robson Thermal MFG, Richmond BC, Canada, and dried and placed into container paraffin wax candles containing 7% fragrance. The candles were lit and allowed to burn for 1 hour. The candles were then blown out and the amount of smoking was measured. Paper-cored wicks 44-24-18P from Atkins and Pearce. Covington, KY, were treated by separately treating the core or the outer sheath of the wick in the liquid flame retardants described in Examples 1-4. Following treatment the wick segment was dried and the wick was then assembled into a complete wick comprised of a core and a sheath. Each wick was placed into container paraffin wax candles containing 7% fragrance. The candles were lit and allowed to bum for 1 hour. The candles were then blown out and the amount of smoking was measured. Clearly, the examples above demonstrate the benefits of the present invention in reducing the length of time that an extinguished candle wick will smoke. The separate treatment of different portions of the wick also reduces the length of time, which an extinguished candle wick will smoke. It was also noted that the length of time of afterglow of the wick was reduced at the same or similar rate that the reduced smoking occurred. This is an added benefit of the present invention. By reducing the afterglow a candle can be produced that is safer to use. Naturally, the reduced smoking benefits the user by producing significantly less soot when the candle is extinguished. The minimizing of the soot formation is a further benefit since soot can accumulate on ceilings, walls, furniture and other surfaces causing damage and unsightliness. An additional benefit to a reduced smoking wick is the minimizing of the malodor that is produced from a smoking wick. In many cases candles are burned to release fragrance into the air that produces a pleasing aroma in the air. When the candle is extinguished the smoking wick expels partially oxidized hydrocarbons into the air. These expelled materials are usually considered by most to be malodorous. The minimization of this is of great benefit to maintaining the pleasant aroma in the air from the fragrance released during the candle burning. 1. A wick comprising: wicking material capable of transferring a fuel to a flame; and a flame-retardant material that is uniformly dispersed throughout at least a portion of said wicking material, wherein said flame-retardant material reduces the formation of embers within said wicking material or reduces smoking of said wick when said wick is extinguished. 2. The wick of Claim 1, wherein said wick is coated with a solid fuel. 3. The wick of Claim 1 , wherein the flame-retardant material is an inorganic salt. 4. The wick of Claim 3, wherein said inorganic salt contains bromine, phosphorous, or boron. 5. The wick of Claim 1, wherein said flame-retardant material is an organohalogen. 6. The wick of Claim 1, wherein said flame-retardant material is a phosphorous- containing compound. 7. The wick of Claim 1, wherein said wick further comprises a solid coating. 8. The wick of Claim 7, wherein said solid coating contains a flame-retardant material. 9. The wick of Claim 7, wherein the solid coating is a solid fuel. 10. The wick of Claim 9, wherein the solid fuel is a wax. 11. The wick of Claim 1 , wherein said wick further includes a sheath and a core, wherein said sheath and core are formed from said wicking material. 12. The wick of Claim 1 , wherein said flame-retardant material is uniformly dispersed longitudinally within said sheath. 13. The wick of Claim 12, wherein said core is substantially free of said flame- retardant material. 14. The wick of Claim 11, wherein said flame-retardant material is uniformly dispersed longitudinally within said core. 15. The wick of Claim 14, wherein said sheath is substantially free of said flame- retardant material. 16. The wick of Claim 1 , wherein said flame-retardant material is uniformly dispersed within a fraction of said strands of said wick. 17. The wick of Claim 1 , wherein said flame retardant material is uniformly dispersed along a longitudinal aspect of said wick. 18. A candle comprising a fuel and a wick, wherein said wick includes a flame- retardant material that is uniformly dispersed throughout at least a portion of said wick, wherein said flame-retardant material reduces smoke production or afterglow of said wick after said candle is extinguished. 19. A method of producing a candle having the property of reduced smoke production following extinguishment, comprising the steps of: manufacturing a wick, wherein said wick includes a flame retardant that is uniformly distributed throughout at least a portion of said wick; incorporating said wick into a candle, wherein said candle comprises solid fuel capable of burning.